Continued from a page on imitations of the "galley" type. 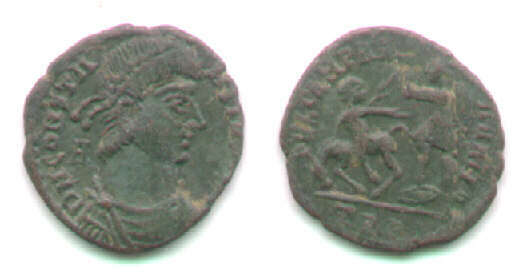 The offical "soldier spearing fallen horseman" type declines in diameter from about 24 mm at its initiation c. AD 348 to about 17 mm c. AD 361. Full-size AE24 imitations of the large issue are rare and medium-size issues are distinctly uncommon, but small-size imitations ranging from 17 mm down to tiny pieces below 10 mm are extremely common, especially in Britain. Prototypes here: Large, AE25-23: RIC Antioch 132. 4:30. "AD 350-355". The gamma in field left identifies it as from the "first series" (among three) in this time period. It therefore dates c. 350-1. 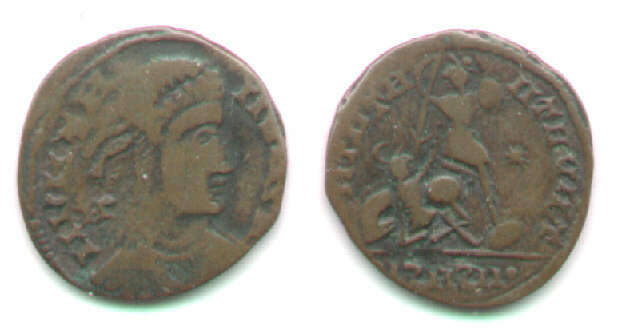 It is the same size and weight as coins from the first issue dated "348-350." /FEL TE-EPIIRIITIO [approximately] These are legilbe letters, not just letter-like forms. This contrasts with the next coin. Prototype: RIC Arles cf. 103, 105, 123 for Constans but reverse closer to 133 (photo), however no "A" in either field. Bruck, p. 16, says official types always have an "A" on the obverse. Sold to me with the note "Probably from a Romano-British site" and I agree. Very obscure legends. An attempt at letter-like forms. 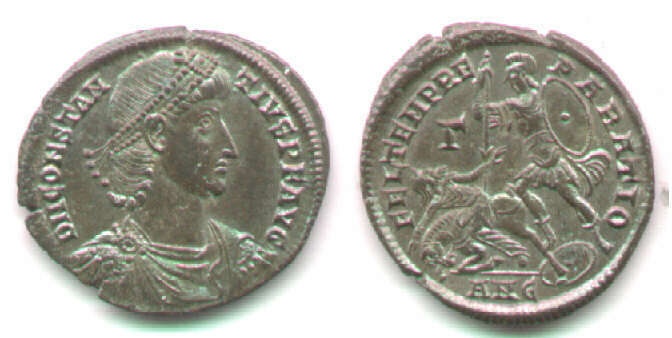 (This contrasts with the legible lettering on the previous coin.) Behind the bust is an "A" like form, which is on coins from Western mints. 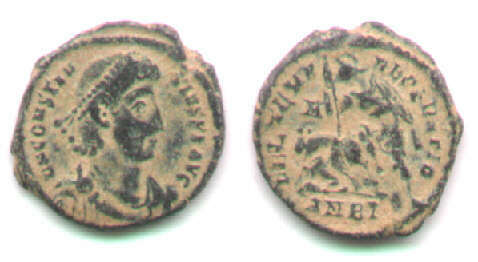 The obverse legend seems short, which suggests the prototype was Constans rather than Constantius II. /Star behind soldier in right field. 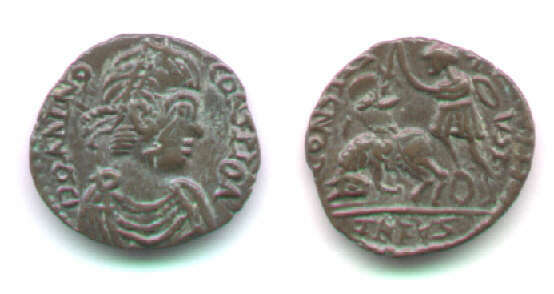 Reference: Mabbot 4753 is Constans, and 4761 is similar. Good lettering. Much weakness on the reverse 1:00-4:00. The mintmark, if any, is off the flan. Cf. Bastien ANSMN 30, #27, 28. An imitation in good style, not far removed from official style. However, the legend break "A-N" is not official. 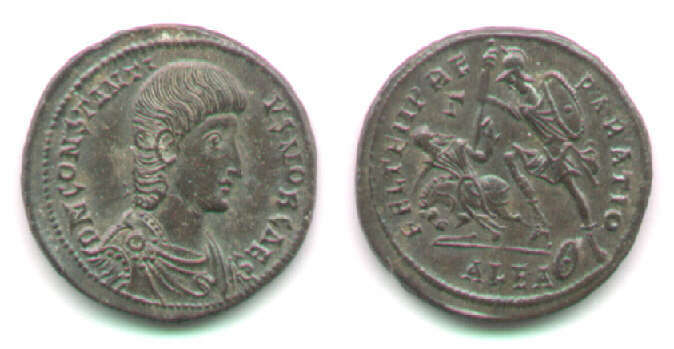 The "A" behind the head belongs to the previous, larger (AE22-20) issue, and the style is slightly odd, especially the nose and horseman. /FEL TEMP RE-[ ]TIO There may be a letter (the "P") that failed to be engraved. Prototype: RIC Trier page 167, size of 358 but "A" from 350. AE18. 1:00. 2.18 grams. 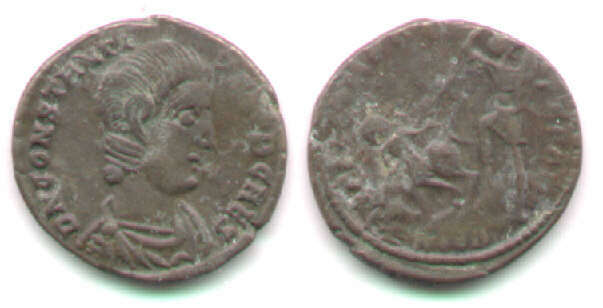 A very rare instance of DOMINO being spelled out on the obverse DOMINO CONSTIOA, diademed, draped and cuirassed bust right. The engraver must have been somewhat literate. DOMINO is spelled out which never happens on official obverses. /CONST....VST, approximately. Imitation: AE21. 12:00. 4.07 grams. Prototype: (large example) AE24-23. 6:00. 6.14 grams. A (nearly) full-sized imitation in good style with some crude lettering. /FEL TEMP R-EPARATIO attempted with many recognizable letters. Gamma (tilted) in field left. Prototype: Alexandria mint. 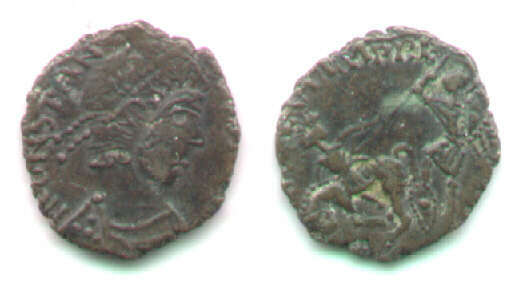 RIC Alexandria 74, March 351 to Winter 354. Sear 4055. 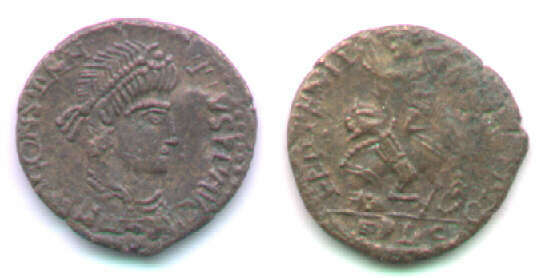 Imitation: Ex Vecchi 15, lot 1656. Another full-sized imitation. Excellent obverse and weak reverse. /FEL TEMP REPARATIO attempted, but the strike is very weak. No letter in field. Prototype: Alexandria mint. 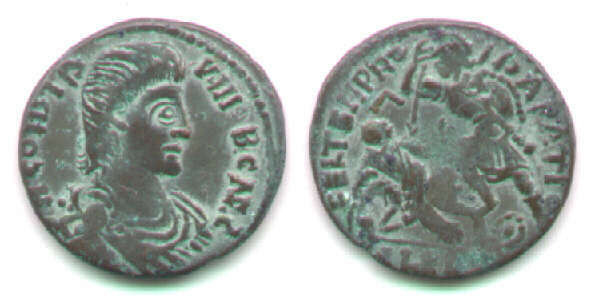 RIC has no such combination of control marks for Gallus, but the previous issue for Constantius II (RIC Alex 44, page 541) has this except for the lack of shield on the ground. RIC Alex 81 is similar (see the plate for #80), but much smaller. I have not seen a small-size imitation for Gallus. A bare head would characterize it. The two above are eastern, not British, imitations, and eastern imitations are much rarer than British examples. Apparently only the western imitations were produced in the much-reduced sizes so commonly seem in Britain. Continue with the page on other post-reform imitations. Return to the page on "galley" imitations. Return to the main Table of Contents page on imitations.